Collectors were extremely active but also selective in buying coins last week, new US Mint sales figures reveal. While fewer numismatic products outperformed their previous weekly gains — 41 versus 72 from the time before — several soared with incredibly rare weekly increases. Most of the Mint’s American Eagle coins were on fire. On the incredible side, 2011 Proof Silver American Eagles rallied with a weekly pick-up of 133,420. That is nearly one and one-half times the amount sold during the prior two weeks combined. And those were no slouchers, as they were the first two full weeks following the Eagle’s June 30 release — a time when sales are generally the hottest. 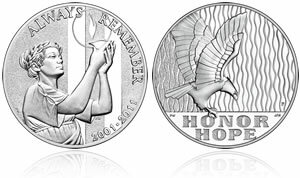 2011 Proof Silver American Eagles now sit with a total of 593,461. 9/11 Medals also shined in the arena of US Mint sales of silver products. West Point minted 9/11 Medals jumped 9,830 to 51,289 while Philadelphia minted 9/11 Medals surged 6,658 to 30,353. The increases were easily the best since the first few days of their June 20 release. The US Mint last week, and this week, raised prices on all of its collector gold coins after several days of record high gold prices. The costlier gold coins did not deter collectors, or they were savvy enough to make their purchases prior to the Wednesday price hikes. All but one of the Proof Gold American Eagles scored better weekly sales. The clear stand out was the one-ounce size. It ran up 4,511 versus 2,362 from the previous week, which was in itself a solid increase over recent gains that registered only in the low hundreds. US Mint investment-grade bullion coins had a mixed showing. One ounce bullion Gold American Eagles easily recorded one of their best weeks of the year while bullion Silver American Eagles just as easily notched one of their worst weeks. The Gold Eagles surged 27,500, which was more than double their previous and typical weekly level. The Silver Eagles limped in with just 540,000 as compared to a more normal area of around 750,000. The latest US Mint sales figures for bullion and collector coins and sets follows. Chickasaw 5 Oz Silver ? ? ? *The as of date for US Mint sales of bullion coins is Wednesday, July 27, 2011. For reference, 53,000 of the 2010-dated 1 oz Gold Eagles remained for sale earlier this year and are included in the overall totals. The bullion sales figures also include 469,500 of the 2010-dated Silver Eagle bullion coins sold in January. **While the US Mint did not provide new per coin sales totals for the Olympic and Vicksburg America the Beautiful 5-ounce Silver Bullion Coins, it did indicate that the series advanced by 4,900 coins since last week, bringing their total July total to 16,300. The individuals Olympic and Vicksburg totals listed above are as of Monday, July 11. The collector coin sales figures above have an "as of date" of July 25, 2011.